Build your home office with personality when you bring home this rustic style l-shaped desk. 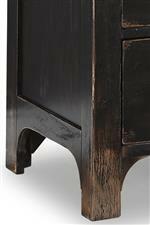 The piece shows its character thanks to a rubbed through black finish that creates a unique weathered look. Meanwhile, the desk also adds ample storage and function to match the needs of the modern world. The piece comes with a built in charging station and wire management that makes keeping your space look clean a breeze. Six drawers of varying size and features also contribute to helping you stay organized and a pair of locking file drawers add security and peace of mind making this the perfect desk for your home office. The Homestead Rustic L-Shaped Desk Built-In Power by Flexsteel Wynwood Collection at AHFA in the area. Product availability may vary. Contact us for the most current availability on this product. W1337-7412 Desk Return 1 48" 24" 30"
W1337-747 Hutch 1 66" 14" 45"
W1337-7411 Left Desk 1 66" 30" 30"
The Homestead collection is a great option if you are looking for Rustic furniture in the area. Browse other items in the Homestead collection from AHFA in the area.